The original plan was to make Almond Salty Butter cookies for a boxing match. Then this recipe appeared in the twitter feed. It blew the little cookies away. Besides, the boyfriend loves bananas. His younger sister is hosting a fabulous party, and we showed up empty handed at her last event. So, this recipe is a delicious imitation from Megan Gordon’s Banana Pudding from 'A Sweet Spoonful'. The least I could do is make a Simple Sugar Cookie recipe to contribute to this dish. The pudding is incredible, because it’s not from an instant mix, and it’s using real whipped cream. Megan’s blog is full of other beautiful recipes, too. Her recent post, Throwing in the Towel, is appropriately named for this weekend’s boxing match. It’s content is unrelated to the sport, but it’s nice to hear about another topic that doesn’t include the words: boxing, Floyd Mayweather, Shane Mosely, sports, and Las Vegas. Thanks, Megan for sharing a girly recipe amid this testosterone day. 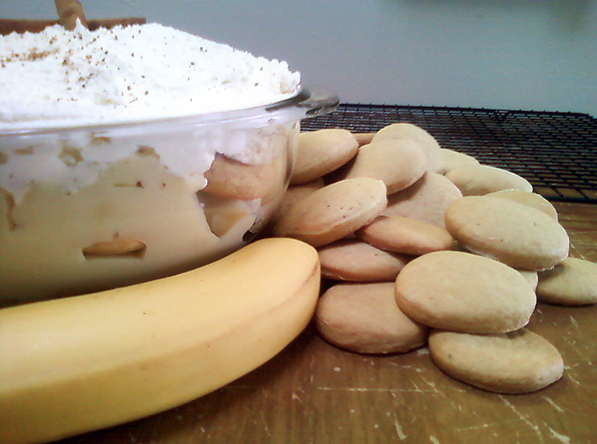 Get the Sugar Cookie and the Banana Pudding recipe at www.MyLifeRunsOnFood.com.